With Band-in-a-Box 2015, we've released an amazing amount of new Add-ons. Along with the 101 New RealTracks and 1,000 Modern Loops with Techno, Dubstep, Worldbeat and Top 40, we also have 49 Bonus UNRELEASED RealTracks, 15 MIDI SuperTracks, 46 Artist Performances and 20 Instrumental Studies for Guitar that are only included in the 49-PAK which can be added to your Band-in-a-Box for Windows purchase for just $49! 33 Jazz RealTracks: We expanded our "pollwinner" collections with more RealTracks by some of the greatest jazz musicians in the world! We have jazz waltzes, ballads, jazz swing and bossa RealTracks made with such recognizable names as Phil Woods (alto sax), Ron Carter (bass), Kenny Barron (piano), Lewis Nash (drums), Gary Smulyan (baritone sax), Eric Alexander (tenor sax), and Mike Moreno (electric guitar). 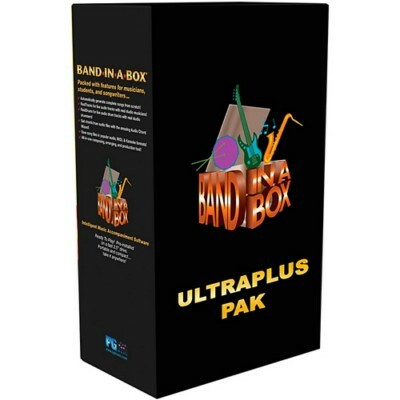 This all-star band is any jazz musicians dream, and you can have them playing over any chord progression in any key, simply by typing in the chords into Band-in-a-Box! In addition to these RealTracks, we also have some great "Funky Folk & More" styles, with Gypsy-Folk styles on guitar and banjo. We also have Jazz-Funk synth styles, and an ever-increasing selection of sax & flute RealTracks soloists. As if that wasn't enough, we cover the "Rockabilly" genre in our jazz collection with some rollicking "Jive" styles. 32 Country RealTracks: Our "Rockabilly explosion" continues in the country sets with two distinct groups, a group of "Boom-Chick" RealTracks in the style of the great country musicians of the 50s, as well as a slow swing group of RealTracks in the style of the earliest Rock 'n' Roll and Country. Also included in the country collection are more "New Orleans" styles to add to our existing collection. We have a "Mardi Gras" group of RealTracks, as well as a cool shuffle. In addition, we've got more great styles by Nashville guitar master Brent Mason, this time playing fantastic electric baritone guitar styles, including a Boogie soloist, "Spaghetti Western" and more! We've also listened to our customers with several new "Requested" RealDrums, and we've also included some "Hip Folk" RealTracks, with banjos & guitars covering the basses. 36 Rock-Pop RealTracks: This release features the exciting new REAL String Quartets! These are recordings of real string players playing violin, viola and cello, and can play over any chord progression you enter into Band-in-a-Box! There are "chamber" and "hall" variations so you can pick the right sound for your song. These styles work great over pop songs, country songs, jazz tunes, or even as the basis of a classical composition. In addition, our pop & rock collection has also been enhanced with new Horn Section RealTracks, with our "Funky Horns". This is a two-part sax section (alto & tenor) that works great over funk or rock tunes. We've also now added Rockabilly styles, Motown bands, and "world" synth styles.